This is such a big topic and one that really hits close to home for me, especially having a history of an eating disorder. It’s one where I have so much to say that the thoughts and ideas I have start swirling so fast and furious in my mind that sometimes it’s hard for me to speak coherently on the topic. 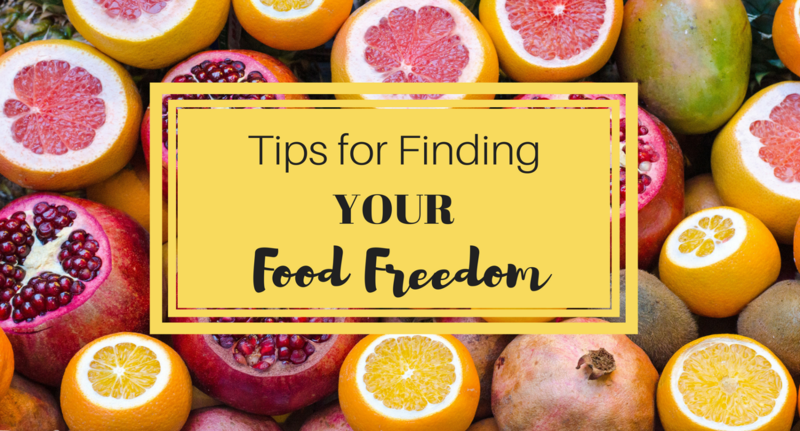 I’m going to try to provide you with some key information, though, that has been incredibly helpful to my clients and to myself in our journeys to food freedom. First, what does food freedom even mean? Well, it is likely to LOOK & FEEL different for each one of us, but it’s the same basic premise for most. 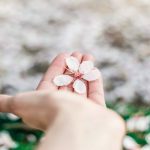 I like to think of it as having control over food (rather than food controlling you) in such a way that it provides freedom – freedom of choices, freedom of mind, freedom from emotional eating, and freedom to experience greater health and happiness. Our approach to food can really span the spectrum from intense restriction all the way to uncontrollable binges. Wherever you are on the spectrum, food may have more control over you than is comfortable, which is why I strongly advocate for you to begin to find a more peaceful and neutral ground. I watch, see, and hear from people all over the world, all of the time who struggle with their relationship with food. Sometimes, they aren’t even fully aware of the struggle. In fact, I think it’s become so commonplace, that people have begun to think it’s normal. Let me assure you – it may be common, but it’s not a burden you need to carry. There is real hope for a peaceful, comfortable, happy, and healthy relationship with food. It is possible to reach a place where food and food-related decisions are not a constant thought on your brain. Speaking from my own personal experiences and those I’ve had with my clients, I would venture to say that a HUGE amount of the time the challenges we experience with finding our food freedom are connected to our emotional, psychological, and spiritual health in a big way. Perhaps you’ve (whether inadvertently and subconsciously or consciously) discovered that a food you enjoy, such as chocolate, ice cream, chips or fries, lights up the pleasure centers of your brain and make you feel happy…even if only temporarily. So, the next time you feel sad, angry, or depressed what might you reach for? Oh yeah, that food that made you “feel good”! As you know, having those types of feelings aren’t usually enjoyable. They can be REALLY HARD!! It seems much easier to distract ourselves from those emotions, than to WORK THROUGH THEM—to actually ALLOW them and learn from them. So we practice escapism. Well, perhaps you’ve also noticed that we don’t ever truly escape them. Whatever we run from is likely to catch up with us at some point. And if we keep shoving those emotions back down, we add to the burden. Food can only numb us for so long. So, what do we often do? Keep going back for it! Or, the opposite: find control by restricting further and further! and it’s not your fault!!! It’s a behavior that is tied to a lot of shame and guilt. Because of that, people don’t often talk about it openly. But we live in a time where highly palatable food is in overabundance for a large part of the population. Like all living things, the primary human objective is survival and procreation. So, when we find food that is not (obviously or immediately) poisonous, it is literally in our DNA to consume as much of it as we can and as often as we can. In the days of our former hunter-gatherers, this type of non-poisonous food was required for survival and would come in limited quantities, only for a certain amount of time. In order to obtain it, physical activity or labor was also required. This is likely in stark contrast to the daily experiences of those reading this. What’s even crazier is that we now have “food scientists” who are engineering food to actually MAKE us desire more. Scientists have learned enough about what flavors, textures, and so on, light up the pleasure-centers of the brain the most so that the desire and cravings for those foods get turned up high. Obviously we can figure out why this is important to the food industry: revenue, of course! But it’s detrimental to our pursuit of a healthy relationship with food. I’m sure most everyone reading this is familiar with the experience of how high fat, salty and sweet foods can really drive cravings and consumption, right? You know how it goes… you eat the chocolate bar and then you want chips. When you’re done with the chips, you want something sweet again and on it goes. When we start with an emotional, psychological, or spiritual issue and we eat foods that light up the pleasure-centers of our brain, it reinforces our desire to keep doing it. And because the pleasure we get from eating these highly palatable, engineered foods is temporary, it drives the behaviors even more. Hopefully, you see how something that is initially unrelated to food can easily start to play a large (and uncomfortable, if not dangerous) role in our relationship to food. One of the most important things I can communicate here is that WE MUST GO BEYOND THE FOOD! Right? It’s that same message I keep preaching here! Yep- to achieve food freedom, we have to go beyond the food! 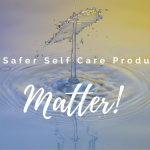 We also have to take time for REAL SELF-CARE! Not just taking a bath or getting a massage (those are great too), but taking the time to dig deep into our emotions, our mindset, and our spiritual health! I won’t elaborate much more here on these ideas because they’re literally the topic of MOST of my posts. WE ALWAYS HAVE A CHOICE! And with choice comes responsibility. Gosh, now I sound like a parent (which I am), but it’s so true. If we truly desire food freedom, we have the RESPONSIBILITY to love ourselves enough to find out how food affects us—to really tune in and experiment with how it makes us feel. As I’ve discussed here, often deciding whether a food choice makes us both HAPPY and HEALTHY can be a great way to start to establish control, with a sense of freedom. When we remember that we always have a choice, we come from an abundance mindset versus a restriction mindset. We are focused on what we can have versus what we can’t. There’s great freedom in that. It’s here that I want to add to our discussion the work of Gretchen Rubin. 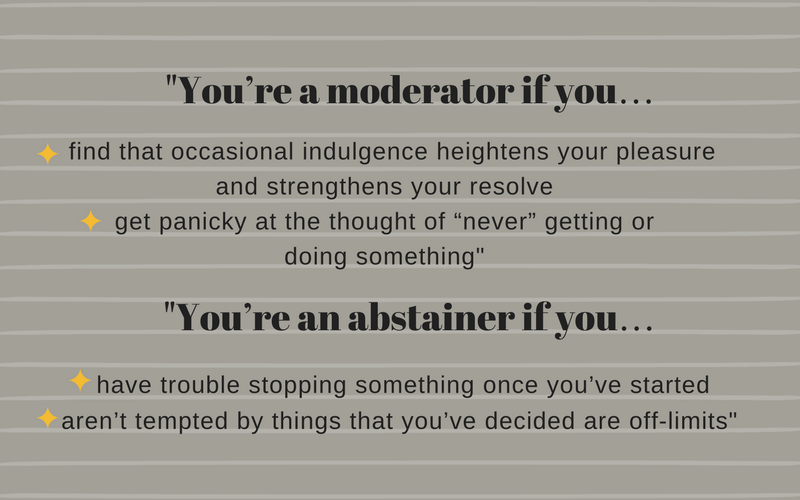 You’ve heard me talk quite often about her Four Tendencies Framework, but this is a classification that I’ve talked less about: Moderators vs. Abstainers. I introduced the topic in this post. Knowing which distinction best describes you may really give you great insight to your individual human nature. Let’s go back to some of those highly palatable foods– say you’ve got some chocolate in the house (lots of people like chocolate, but if you don’t, replace that word with something you do like– perhaps ice cream, french fries, chips, cookies, etc.). Are you perseverating on when you can have some, how much you’ll have, and how often you should have it? Or are you able to forget about it and simply have a little bit when you feel like it? You see, an abstainer typically does better with simply saying they won’t have any of the chocolate (or other “X” food). If they do have some, they often overindulge. When they abstain, they no longer feel tangled in constant thoughts about it. It actually feels FREEING to simply go without. A moderator, however, feels much more comfortable when they have some whenever they desire. And then when they do, they are able to have just a little bit. These are the people who may not finish their dessert. Abstainers think they are crazy and cannot figure out how they do that. Sometimes it can be challenging to distinguish which classification best describes you, though. If you are a moderator who is trying to abstain, you may think that you’re an abstainer because you’re constantly thinking about the chocolate (or whatever else it may be) and you may overindulge when you eventually allow yourself to have it. However, when you give yourself full freedom, you are actually able to moderate very easily. You see, the abstainer wouldn’t experience that tangle of thoughts when they are abstaining. They experience them when they are trying to moderate, instead. Does your relationship with food make you feel like this? 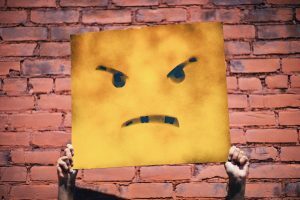 If you’ve ever been told that you should just give something up entirely and it made you feel “crazy,” it’s likely you’re a moderator. If you’ve ever been told you should just be able to practice something like the “80/20 rule” and that made you feel “crazy,” you’re likely an abstainer. Neither is wrong! Each camp kind of feels the other should be able to find success the way they have. Like Gretchen’s Four Tendencies Framework, you may not be able to make many changes to this part of you. It’s more like something you can use to start to know yourself better. You can embrace it and use it as a strength, rather than a weakness. The question or concern I do have about this classification is that I feel there may be some people who are really great at control who tell themselves they are abstainers. They have such a restriction mindset that when they try to give themselves freedom to the food, they binge because they’ve been saying no for so long. It’s very possible, however, that if they continue with this freedom mindset, they may find their peace with that food. They will realize it’s there to stay and there is no need to binge on it. They may realize that it doesn’t feel good to binge on it, but that it feels great to enjoy it on occasion with full control, yet freedom. They no longer have to fight with their mind and body for the control. Instead, it happens naturally by supplying the freedom and then listening to their body. I know this because I’ve experienced it. I’m an abstainer – across most areas of my life. And remember how I said I experienced an eating disorder (see my story here and here)? I was GREAT at control. But I WASN’T giving myself the CHOICE. NOW, as an abstainer, I actually ALSO do a great job moderating because I give myself the FREEDOM to choose. I’m not longer simply restricting for the sake of control. I abstain from certain foods because it gives me FREEDOM and because I’m making the choice for my health! I’m free to have whatever I want, but I don’t want just whatever! I want to FEEL GOOD – I choose to be HAPPY & HEALTHY! So, if you are someone who finds your food freedom from being an abstainer (obviously not from all food entirely) – just make sure that you’re also giving yourself freedom to CHOOSE that! Don’t lock yourself into being an abstainer because you’re good at control, but because it actually gives you FREEDOM and makes you HAPPY & HEALTHY! On the other side, if you’re a moderator, take the responsibility that comes with having choices. Take the time to understand how certain foods make you feel. Utilize that moderation in a way that prioritizes both your HEALTH & HAPPINESS! So, there you have it! I hope I’ve provided you with some value in finding your food freedom. If this is an area in which you’d like support, please let me help you! Check out my services and send me a message! COMMENT AND LET ME KNOW HOW YOU EXPERIENCE FOOD FREEDOM! I’m an abstainer. I have chosen to avoid certain foods because I don’t enjoy the lack of control I have over them if I try to eat just a little. I feel much better avoiding those foods. Knowing you, I would definitely agree with this. It seems you find freedom in abstinence. I’m so helpful you found it helpful, John! Thank you!